Part of his essay, however, was devoted to a comparison of our reaction to “shoe bomber” Richard Reid, which is illustrative in a number of ways. As it turns out, Wayne LaPierre’s $970,300 compensation makes him the 11th-highest paid “charity” executive in the country, and given his ability to control both sides of the gun policy debate, he’s a bargain at twice the price. However, a new poll by Frank Luntz, commissioned by MAyors Against Illegal Guns, shows that gun owners aren’t getting what they pay for. The survey of 945 gun owners nationwide (divided evenly by gun owners who were current or lapsed members of the NRA and non-NRA gun owners) found overwhelming support for common-sense measures that LaPierre’s organization opposes. Bu the Richard Reid comparison exposes the central lie of the gun-crazy wing’s argument, that, as Se. Johnson said, “you simply can’t keep these weapons out of the hands of” those who would terrorize the way James Holmes did. Setting aside the specific shoe-removal measure, the much-derided efforts of the Department of Homeland Security and the TSA to secure air travel, while varying in their logic and execution, actually have worked, in a specific and demonstrable way. Lost in the angst over this is the fact that screening measures have forced the terrorists to use PETN, a substance that doesn’t work. The only successful use of PETN as a primary explosive was an attack that killed 1 and injured 23, and that took 24 kilos of the substance to accomplish. Try fitting that into your shoe. Does that mean we’ve eliminated terrorism, or even made air travel completely safe from it? No, but we have demonstrably made it safer, and eliminated several types of threats, just as banning these 100-round clips would do. Of course, terrorists will look for other ways to attack Americans, and in fact, they’ve already found one. Over a year ago, an Al Qaeda spokesman named Adam Gadahn issued a call for aspiring terrorists to exploit weak US gun control laws to carry out mass murder like that perpetrated by James Holmes. If and when that happens, Wayne LaPierre, and every Republican or Democratic politician who’s more afraid of him than even the Islamic Terror Menace, will have a lot of explaining to do. In the aftermath of the Aurora shooting, there have been calls for a cooling of the type of provocative rhetoric that O’Donnell deploys nightly, but if an issue is worth fighting for, it deserves fighters. 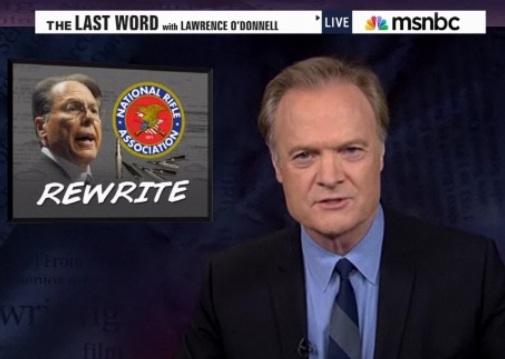 Maybe Wayne LaPierre ought to step into the ring with O’Donnell.